We brought Wee Man home from hospital when he was three days old. I remember a very proud Monz Man turning up at the hospital with the car seat, nervously strapping Wee Man into it, then gingerly walking through the hospital to the car with our precious bundle. I was waddling behind desperately trying to keep up, then quickly thought better of it when a stitch twanged – eek!! We drove home feeling every single bump in the road and adhering to every speed limit for the first time ever quite possibly! He was just too precious to take any risks with…still is. The first week at home went relatively smoothly – well, I did get told off by the midwife on day four for letting Wee Man sleep for five hours straight and not waking him up to feed him. However, he’d been awake for the previous eight hours screaming, feeding, screaming, feeding then screaming again…so my instincts kinda told me he was a bit tired and so the hell was I!! But being a first time Mum, I thought I’d done something wrong so took to trying to *make* him feed, even when he didn’t want to. Well, knowing what I know now, it’s no surprise that he found a way to tell me right where to put my attempts to force feed him – even baby gums hurt when they bite! Feeding and sleeping were our early main issues with Wee Man. I know this is very normal for newborns, but there was something different about all this – he was definitely in pain and very unhappy. I took him to see five different GP’s from the age of four weeks to ten weeks. Eventually we were given infant Gaviscon to try but this relied on him actually taking the stuff…which he didn’t! I never realised such a small baby could be so wilful, determined and be able spit so far! Every day became the same; feeding; screaming; feeding; screaming; thrashing; fighting; trying to get dressed; feeding; screaming; trying to feed myself; screaming; trying to get out the house; screaming; feeding; feeding; screaming; screaming; screaming…days merged into weeks into months. All the same. I knew something was wrong, but all the other new mums were complaining about lack of sleep and lots of crying, so why should I think that we were any different? But we were; I’d watch in awe as their new babies would latch on to the breast, feed peacefully, then fall into a restful sleep…Wee Man was definitely different. I spent hours and hours trying to console him. Trying to exorcise whatever it was that was torturing him so. Monz Man and I would take it in turns to hold Wee Man upright on our chests; this seemed to be the only thing that would soothe him and he could at last sleep. Many days and nights were spent like this, just trying to help him rest and sleep. We learned to do everything one handed and to sleep sitting up; hell, I think I even slept standing up swaying a few times! I recall the moment I finally accepted that he was different to other babies; I’d enrolled us on a baby massage course. On the first session, we all took up our spots, laid out our warm towels and gently placed our six week old little beauties on them. Except my Wee Man didn’t want to lay there. He started to howl. And thrash. And fight. The tutor told me to begin massaging him anyway as it would calm him. Err…well, that didn’t quite work out. Instead of calming him down, I instead sparked a spectacular sensory melt-down and it was scary…and long; four hours long to be precise! At twelve weeks we finally got to see a wonderful Paediatrician who diagnosed gastro-oesophageal reflux. She described drugs that would help, but I insisted on a Barium X-Ray before introducing medication to my teeny tiny Wee Man. Sure enough, the X-Ray showed severe reflux, so I gave up all dairy in my diet and we started on the meds. They were fiddly and faffy and impossible to get him to take – remember he could spit!! Eventually he was prescribed Omeprazole, which was far easier to administer, and within a few days, the painful screaming stopped. But by then, the damage to his feeding patterns was done. He would no longer take the breast; he would scratch and attack me if I tried to breast feed him. So, I began a long and torturous nine months of expressing my milk for him. I won’t lie; I hated every single second of it. I was beyond tired, but the only time I could sit down long enough to express would be when Wee Man was asleep, and he only slept for an hour at a time. I wanted to stop so, so many times, but I didn’t. No one else was pressuring me to do it, but somehow I knew it was best for him and that drove me on. With all this going on, we didn’t really notice that Wee Man was missing a few milestones. He didn’t seem significantly delayed at the time, but things that stand out now are that he didn’t smile much as a baby (not really surprising to be honest! ); it was difficult to gain his attention a lot of the time; he hated to be held; he was happiest standing and swaying in his playpen glued to the mesmerizing tunes and images of Baby Einstein; he detested being dressed or changed; he didn’t really babble; but he was always very, very active. He was climbing up the slide in our garden by seven months old, despite not being able to walk until 12 months. He quickly became known as ‘The Hurricane’ at our antenatal class gatherings due to his intense hyperactivity and general ‘getting everywhere-ness’. I went back to work in London when Wee Man was 12 months old. And I was pregnant again…alas that baby, my ‘Little Dot’, was never meant to be and I lost her (I like to think she was a girl) at 12 weeks. I have to say that first year of Wee Man’s life was desperately difficult. But in a way, we didn’t know how difficult it was until now, when we can look back on it from a safe distance and remember. At the time, we thought everyone else was having just as tough a time, so didn’t really think much of it. It was just a case of keep on keeping on…much like today really. I seem to be getting my knickers in a knot over something. And it’s a strange something to me as I don’t usually get wound up by terminology; I usually just think, “oh ok, you say that. I say this. We mean the same thing. That’s cool.” But something really bothers me about referring to people with autism as ‘high functioning’ or ‘low functioning’. But it’s not for the reason you might think (well, not completely). Wee Man is, I guess, classed as a ‘high functioning’ person with autism. I’ve never actually been given this exact specification of his diagnosis (which suited me quite fine thank you very much) but since he can talk and toilet himself (mostly) and feed himself (when he can eat), I guess that’s what he is. But, I actually think that’s quite a dangerous way to define how his autism affects him. Because there are many areas that he is very, and I’m hating using this term (which is one of the very reasons I don’t think it is a useful classification), ‘low functioning’. And there are times that he is very ‘low functioning’ in areas that on some days he might be otherwise ‘high functioning’. I’ve said before he is mercurial. Well so is his autism. It never goes away, that’s for sure. But some days he is more able than others. We don’t ask non autistic people (or ‘neuro typical’ people as they are often referred to as in order to avoid the term ‘normal’ – I tell you, it’s a bloody minefield of potential terminology faux pas out there!!) whether they’re high or low functioning. But if we were to then I’m pretty sure that they would say, “it depends”. I know that, for me for example, if I’ve had very little sleep and a few glasses of wine the night before, then it’s fairly likely that I will be pretty ‘low functioning’ the next day. Give me a good night’s sleep and a gallon of coffee, then I’m on FIRE (very, very high functioning). It is not always consistent. So it’s not so much that I am offended by using the terms ‘high functioning’ or ‘low functioning’; well, maybe I am a little, but it is more that I don’t think they are accurate for all people with autism, at all times. It all depends. Wee Man is Wee Man. He has autism. He has good days. And he has bad days. And that’s all. *this is very typical of a child diagnosed with Pathological Demand Avoidance (PDA) – they appear very able verbally, but still suffer the same communication impairments that come with autism. I was caught off guard recently. A few weeks ago Wee Man asked me directly why he goes to the school he goes to (he’s at a special school for children with autism). My stomach flipped, then quickly sank. I wasn’t ready for this conversation. Trying to find the right thing to say, I told him, “it’s a special school darling, for special people.” He fixed me with a serious look, tears pooling in his eyes and said, “But I’m not special. I’m just normal.” At that point, I knew the time had arrived, to begin the journey of telling Wee Man that he has autism. I’ll be honest with you; the thought of it makes me feel desperately sad. It feels like ‘this is it’. It’s suddenly, completely, undeniably real and he really does have autism. I never lie to my children and telling him that he has autism, means that he really, really does. So, I guess the time has come for me to finally and truly admit it to myself; my perfect, adorable Wee Man has autism*. Therefore, are an autism family. And that’s very OK.
Part of the reason why I think this is that, in trying to prepare him, I’ve been talking about ‘differences’ a lot with Wee Man. Trying to be subtle, I’ll casually say “oh, look, Little Pink has curls in her hair. Mummy doesn’t have curls. We’re different.” But he will vehemently disagree, shouting “No. You’re the same”. And if I point out, “Hey, Wee Man, you’re a boy and I’m a girl. We’re different.” He will still disagree, insisting that we are the same. It’s like he knows what I’m trying to do and what I’m trying to show him…but he doesn’t want to see it yet. I am certainly not pushing the issue, but I know it is on his mind, so I’m laying the groundwork I suppose, for when he is ready to take it on board and talk about it. But it’s actually a really important lesson for all children to learn early; we are all different and that is very, very OK! *I feel I should explain this a little although I will cover it in another blog (it’s not a quick one to explain!). I know Wee Man has autism. But to me that doesn’t matter. It’s a name. It’s something that makes him who he is. This will sound very strange to some, but I forget it. I actually forget my son has autism. It’s not until we are in a situation that he really struggles with (normally out in public) that I am reminded of his difficulties. And then I have to remember, understand and accept all over again…every single time. It’s a very bizarre mindset, but I have very little control over it. Call it a survival strategy maybe. Or, perhaps, it’s just me accepting my boy just the way he is…and that’s pretty bloomin’ perfick!! Wee Man doesn’t eat well. Never has done. And I would take an educated guess that he probably never will. When he was born, he didn’t have the sucking reflex needed to breastfeed efficiently. He did sort of get the hang of it but, at around 24 hours old, the gastro-oesophageal reflux kicked in. From that day forward, our troubled little baby would associate feeding with pain. His back would arch and he’d scream in agony; he was hungry but he was in pain, so he couldn’t feed. We finally got the reflux under control when he was 14 weeks old, but by then the damage was done – he then associated the breast with pain and would scratch and writhe to get away from it. Pretty tough for a new Mum to take, but I kinda knew it wasn’t about me…kinda. Nowadays, our repertoire of foods that Wee Man will actually eat is very limited…and becoming more so recently. My ‘old faithful’ the sausage is no longer an option – no idea what happened, but after eating very little BUT peeled sausages and ketchup for over a year, he now won’t touch them. We appear to be in a food vacuum zone yet again…so, when I hear that almighty but desperate screech, “I’m starving, I want summit to EAT”, I’m sent into a panicking flat spin. Because by the time he actually realises what he’s feeling is hunger, and is able to vocalise it, he will indeed be starving hungry. And very, very grumpy; Wee Man can go from happily playing and being a delight, to being a starving, aggressive devil-child in 0.06 seconds – flat! So, it’s up to me to feed him. But what do I give him?? Like a lot of issues associated with autism, Wee Man’s ability to eat is closely linked to his anxiety levels. He can’t be referred to as a ‘fussy’ or ‘faddy’ eater. His relationship with eating goes beyond choice or not liking a certain food. The anxiety and fear that comes over him when he’s presented with a new food is just heartbreaking to see; it’s like he’s had a plate of poison placed in front of him, and he is so starving that he desperately wants to eat it…but he can’t – something inside him makes it impossible for him to move that piece of food to his mouth. Wee Man’s school have been brilliant with helping him become more comfortable around food, but even they report that when a new food is presented, he has to hold an adults hand before he can go near it. Eating is also a hugely sensory experience. Wee Man has Sensory Processing Disorder which means he doesn’t feel things in the same way that we might. The smells, tastes, textures, temperature, colours and even sounds of foods and eating is completely different for him. How exactly, I will probably never know, but I just know it’s different for him. For years, I’ve tried to identify what tastes and textures it is that he prefers, but he’s so mercurial with his eating, my list is never static or complete. Another factor that comes in to play with Wee Man’s eating is control. There are many, many things in his life that he can’t control (not for lack of trying) but he absolutely CAN control what goes into his mouth and what is swallowed. It’s a basic human function that cannot be controlled by another person. 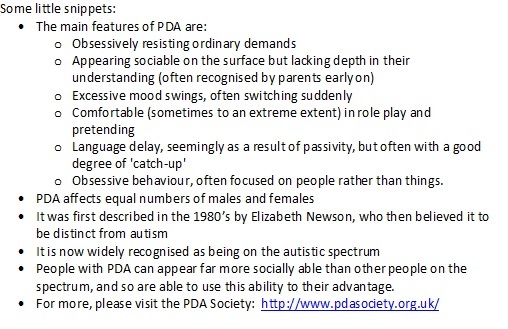 Wee Man’s PDA (Pathological Demand Avoidance) makes it impossible for him to take on demands, and feeding has to be one of the earliest demands we place on our children. Hell, you’re not allowed to leave the hospital until baby is feeding properly right? We’ve had to completely chill out when it comes to food and mealtimes at home. There’s no pressure, no demands to use the correct cutlery, or sit still at the table. No, “you have to eat all your dinner or there’ll be no treats”. I’ll be honest, it drives me nuts, but if Wee Man eats something when he’s wandering around the kitchen stark naked, then I don’t care – he ATE something! We also let Wee Man eat when he’s hungry, rather than trying to make him wait until ‘mealtimes’…by then he’ll either be past it and tearing down the house or he just won’t eat. Nutritionally we have to look at what he eats over the space of a week, rather than trying to cram in five (or is it seven now?!) portions of fruit or veg, meat, carbs, blah blah blah, into one day. That just ain’t ever gonna happen! What is proving difficult is trying to instil good eating habits in Button and Little Pink. Button isn’t particularly easy to feed, and I think a lot of that is because he so adores his big brother and copies a lot of what he does. He’s also had his own gastro problems which I’ll cover another time. So far, Little Pink tries, and enjoys everything I give her – long may that continue. Feeding a hard to feed child is such an emotive thing. As a parent it’s tiring, frustrating, worrying and downright depressing at times. One of the key roles in my job description as a Mum is to make sure my children are fed well, so they can grow and learn and develop – how can I do this if my child can’t eat?